Home - See wildlife at work like never before with Springwatch! See wildlife at work like never before with Springwatch! We’ve got all of a flutter over the new series of Springwatch, which returned to our screens last night. Michaela Strachan, Chris Packham and Martin Hughes-Games are with us for the next three weeks, presenting live shows and bringing us some incredible wildlife tales from all over the UK. It’s going to be great! Spring is when nature comes to life. It’s the time of year when flowers bloom, insects get busy and bird songs fill the air as they compete for territory and attract mates. There are lots of stories happening in gardens, parks and woodlands, and Springwatch does a fantastic job capturing them for us all to enjoy. It’s been a difficult start to this year’s spring for many of our country’s species due to the heavy snow that fell in March. Springwatch will be looking at what triggers spring, why it happened so late this year and how the UK’s wildlife has been coping in such difficult circumstances. Sadly our garden birds haven’t been coping for a long time. Even before the icy cold start to this year’s spring, numbers have been on the decline. Our Birds of Britain infographic shows the scale of the problem – and how you can help build those numbers back up! The first episode of the new Springwatch series aired last night and followed the plight of red kites, wild boar, dolphins and otters. Tonight’s episode will focus on the iconic kestrel and brings us the very latest on a remarkable story of an osprey family. Their live shows are coming from the RSPB’s Ynys-Hir reserve, near Aberystwyth in west Wales, where oak woodland meets wet grassland and saltmarshes. It’s the perfect location to see flycatchers and redstarts emerge from their nest boxes. Ynys-Hir also has thousands of bluebells, which look great this time of year, and they have seven hides from which you can watch lapwings, red kites, redshanks and wood warblers go about their daily business. 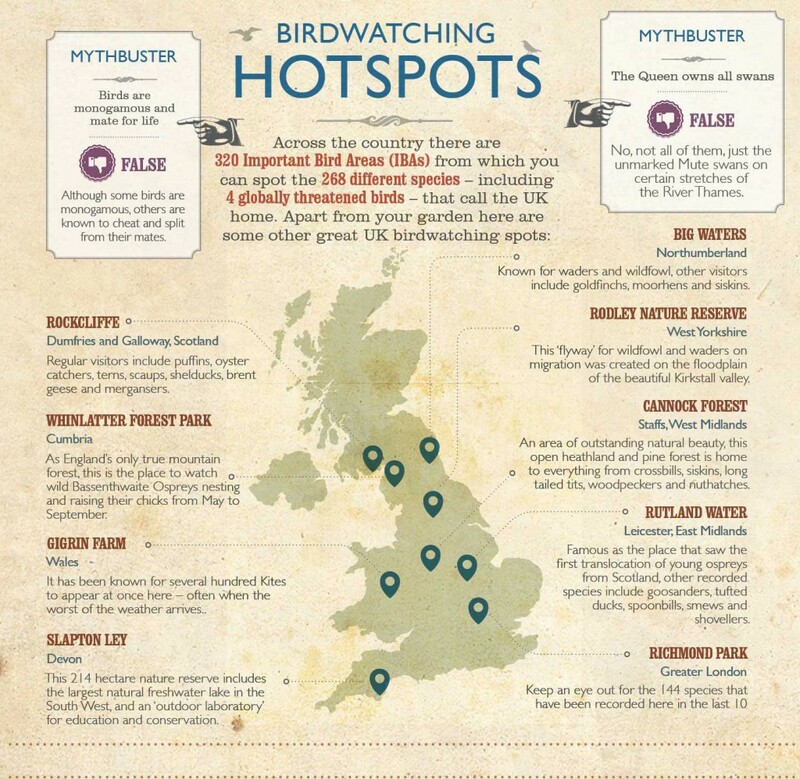 It’s a birdwatcher’s paradise and a perfect place for Springwatch to position their cameras. Springwatch has nest-cams, night vision and slow motion technology to allow us to get closer to birds, insects and flowers than ever before. Future episodes promise coverage of rare birds of prey, how to track elusive deer and why bottlenose dolphins have started visiting a shipping harbour in Scotland. It really is an inspiring series – and it makes you think differently each time you look out of your window and into your garden! Episode two is on BBC2 tonight at 8pm. Check the Radio Times website for the programme’s schedule – and episodes will also be made available on the BBC’s iPlayer, so you’ll never miss a moment!